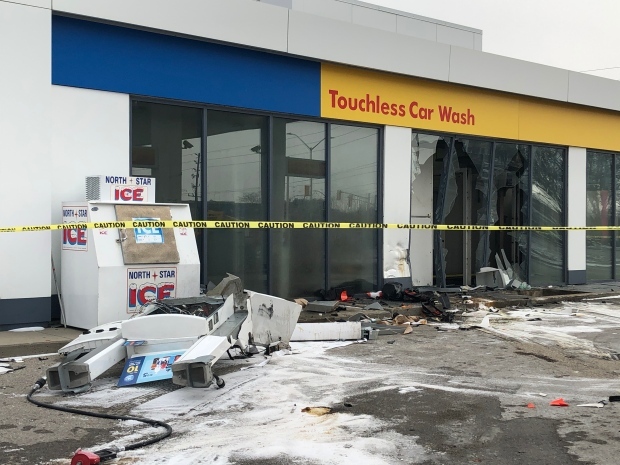 A woman was taken to hospital after a crash that caused extensive damage at a Shell gas station on Fanshawe Park Road Sunday. The woman's eastbound vehicle travelled quite a distance after it appeared to have hit a curb and then knocked over an 18-foot pole at the intersection of Fanshawe Park Road and North Centre Road. The vehicle then struck a gas pump, severing a gas line, before crashing into a car wash on site. An employee was seen sweeping up debris that was scattered throughout the station lot. Police, fire and ambulance were all called to the scene around noon. There is no word on the extent of the women's injuries.